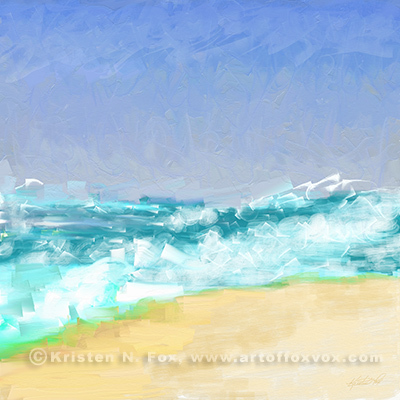 Ocean Vigor is my latest digital painting – what I am calling an abstract landscape. I was really happy to have been able to achieve a real painterly and pseudo-impressionistic style with this seascape. I had to just go with the flow, and enjoy the process of seeing how the digital paint got layed down on the digital canvas. 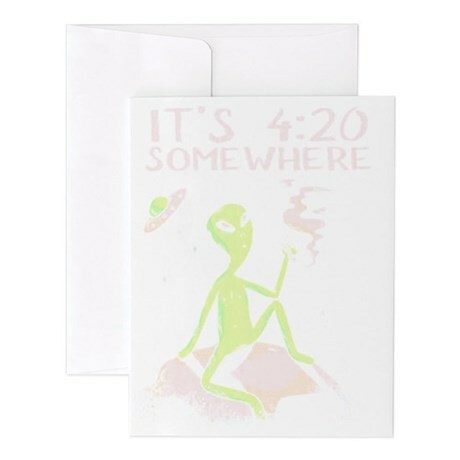 I also have created products for my t-shirt and gift shop – you can see a sample selection of the hundred plus products below – just click on any of these images to see the entire collection. When I look at all of these things together I feel like I’m taking a vacation already, even when I’m not – something about being at the shore and watching the water crash on the beach – like a meditation. Can you smell the salt air yet? And before I forget, Ocean Vigor is also available on bed and bath items like shower curtains, rugs, window curtains, and duvet covers – click here to check them out. 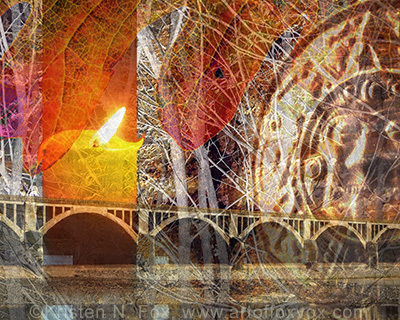 If you’re interested in prints, or want to see a larger version, just click on the image to visit Radiant Heat in my gallery at Imagekind. Thanks! And Radiant Heat is also available in bed and bath items like a shower curtain, duvet covers, throw pillows, cloth napkins, etc. – click here! 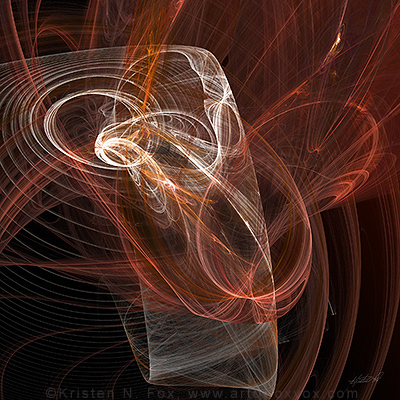 Seventy-five percent fractal art, twenty-five percent photoshop, and one hundred percent digital. 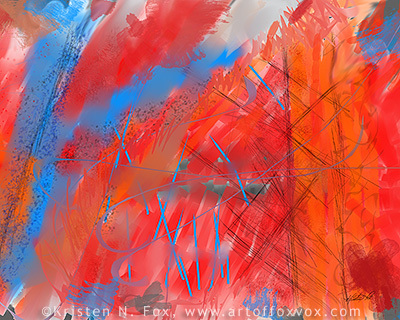 It’s kind of amazing how similar, in essence, the process of creating art digitally and creating art manually can be. Basically, you just keep at until it reaches that mystical point in space-time called “done”. Subaqueous, or ‘underwater’, reminds me of an underwater crystal city. 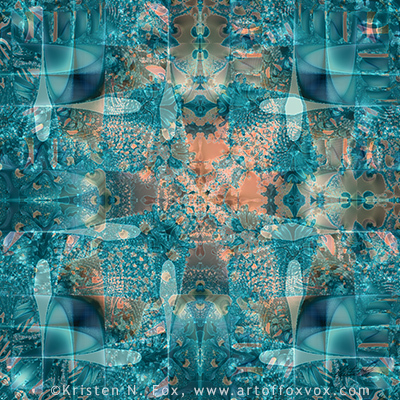 Click the image to see a larger zoom version of the artwork, or to purchase unframed, framed, or canvas prints. It took me quite a while to get this artwork of layered photos and manipulations to the point that seemed ‘right’ – sometimes with art you know JUST when to stop and sometimes you just have to stop yourself and step back – both happened with this piece! I called it Golden Age, not just because of the colors, but because it has stolen time and history and inspiration and focused it to a fine point. Click here to see a ‘zoom’ image in more detail, or to get framed or unframed prints of Golden Age. I’ve been working with a newer version of my old graphics program, getting used to how they’ve changed some of the old functions and playing with the new ones. I had a nice photo of autumn trees as the sample I was playing with, and when I played with the ‘oil painting’ function, I really liked how it looked! I won’t be using this filter on everything, but the result here was colorful and swirly, and you can’t say no to that. Interesting tidbit – some of these trees aren’t there anymore. A few got broken in half and blown over by the winds of Hurricane Sandy.